Memories of the past come alive in our retro cabins on the lakeshore. All housekeeping (bedding and towels included) cabins include full kitchens with microwaves and utensils, cable TV, bathroom with shower. 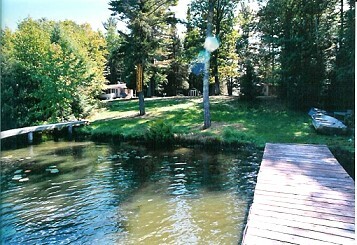 Fire pit, lawn chairs or picnic tables, kettle grills and tools included on cabin units. Aluminum fishing boats are available as well. Riverdale has many repeat customers, but there are still some openings for this summer. Cabin A - A cozy efficiency cabin with one queen size bed, queen sofa sleeper sitting area and complete kitchen. All cottages have heat and ALL have air-conditioning. Well behaved pets and most major credit cards accepted at RIVERDALE.